An MBA can lead to a lucrative career in high-demand fields. Graduates of top-tier business schools usually earn higher starting salaries than their peers who went to lower-ranked schools – but often leave with more debt, according to U.S. News data. Prospective students who want to attend a top school without taking on more debt than they can pay off can compare the average annual base salary for students who find employment soon after graduation with the average debt of graduates who borrowed for business school. Many business school graduates earn bonuses and other forms of guaranteed compensation – which can help lighten the student debt load – but the charts below are limited to annual base salary. Fourteen of the top 20 ranked business schools submitted salary and debt information for graduates of full-time programs to U.S. News in an annual survey. Graduates who were employed three months after graduation at those 14 schools earned an average of more than $100,000. The University of Texas' McCombs School of Business, tied at No. 16 in the rankings, is the best bang for the buck. McCombs' grads had the largest gap between how much students made after graduation and how much they owed in 2015. Students who were employed within three months after graduation in 2015 had an average annual starting salary of $113,787, and those who borrowed had an average debt of $62,525. Fifty-nine percent of McCombs 2015 graduates have student debt. Students who borrowed to attend Duke University's Fuqua School of Business, tied at No. 12 in the rankings, and Cornell University's Johnson School of Business, No. 14, left school with nearly as much debt as they earned in a starting salary. The average starting salary for Duke graduates was $119,056 and the average debt $114,498. The average starting salary for Cornell graduates was $119,051 and the average debt $115,058. Sixty-one percent of Fuqua 2015 graduates borrowed for business school. Cornell did not provide that data to U.S. News. 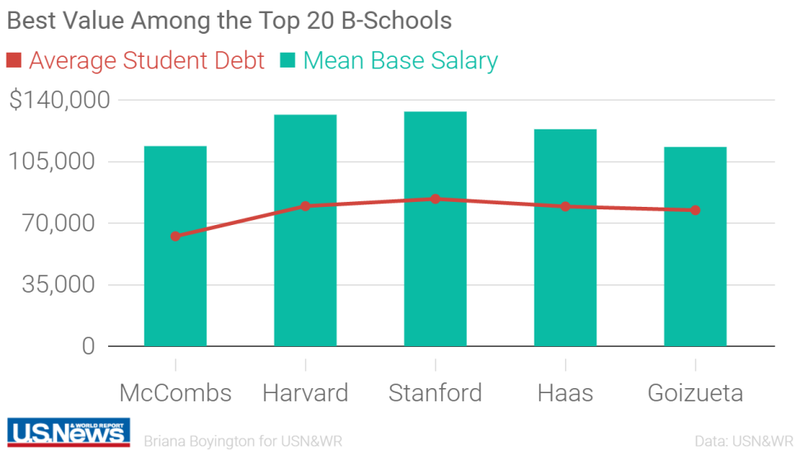 The chart below includes the average debt, annual base salary listed as the mean base salary, and salary-to-debt ratio for the 14 top-ranked schools that provided both salary and debt data to U.S. News for the 2017 Best Graduate Schools rankings. A higher salary-to-debt ratio is indicative of a better deal. Schools that didn’t submit the average debt of 2015 graduates who borrowed to U.S. News in an annual survey were excluded from the chart. The salary and debt data in this chart are correct as of July 20, 2016.